ICCo and its partner Grameen Sahara, a pioneer in livelihood creation and social inclusion at the grassroots, jointly set up the Centre of Excellence (CoE) for Agri-Business and Allied Enterprises in Guwahati. The Centre of Excellence will constitute of 2 major components as its deliverables. One, it will act as a single-window for training, skilling and knowledge-sharing and will consistently strive to upscale itself into a world-class Resource Centre for the Agri-Business entrepreneurs of the North East region. Two, the CoE will have an Agri-Business Incubation Centre, which will work with early stage agri-entrepreneurs and progressive farmers to commercialize and prove their business model transition to growth stage and make them investment ready. The CoE is a first-of-its-kind initiative with an aim to provide an impetus to the Agri-Business ecosystem of North East region. The CoE will play a key role in developing a community of Agri-entrepreneurs in the North East region and boosting up the ecosystem through creation of vibrant enterprises. What Centre of Excellence is? Centre of Excellence (CoE) has been designed to deliver best in class domain knowledge, technical expertise and skills training to promote, incubate and scale agri-entrepreneurship in India. Agri-Business Incubator of CoE will work with early stage agri-entrepreneurs and progressive farmers to commercialize and prove their business model, transition them to growth stage and make them investment ready. Agri-Skills Training and Implementation component of CoE will work with unemployed youth, small and marginal farmers and train them for creating selfemployment, farm enterprises and micro enterprises in agri and agri-allied sector. What we plan to achieve? In the next 3 years we aim to incubate 15 new agri-businesses, boost 50 existing agri-enterprises and train at least 500 rural youth and farmers for self-employment and farm enterprises in agri and agri-allied sector. Who will benefit from CoE? 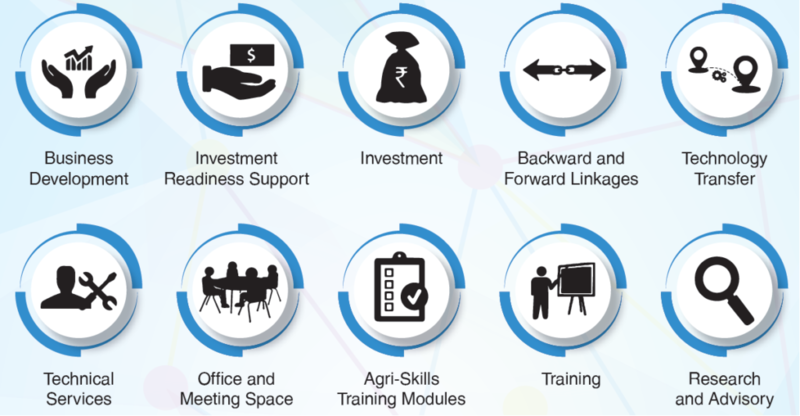 Business Development, Technical Services, Investment Readiness Support, Office and Meeting Space, Investment, Agri-Skills Training Modules, Backward and Forward Linkages, Training, Technology Transfer, Research and Advisory.